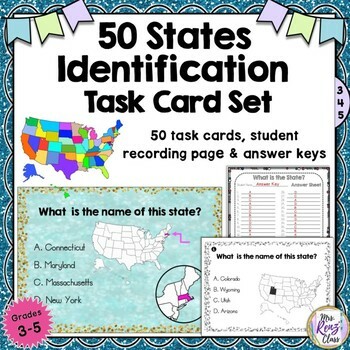 Help students learn to identify the U.S. states on the U.S. map with this set of all 50 states with task cards! The task cards have a USA map with the state colored in. 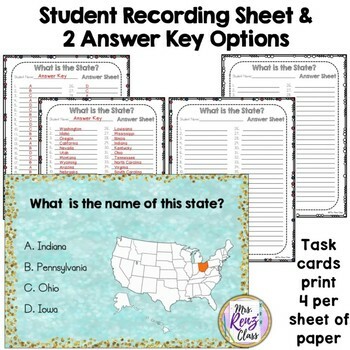 Students are asked to identify the name of each state using 4 multiple choice answers. All 50 states are included with your purchase. 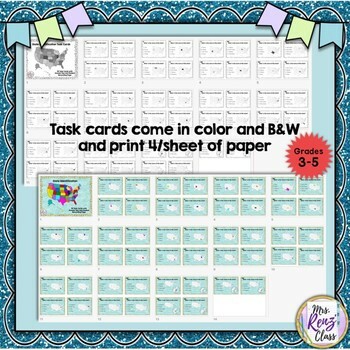 Task cards are in PDF format and print 4/sheet of 8.5 x 11" paper and come in color and also black and white. • Answer key numbered with correct answers listed as A, B, C, D.
• Answer key numbered with the state name written out. Enjoy helping students learn the 50 states!